The Manufacturing Extension Partnership (MEP) Supply Chain Optimization program recently released an online, interactive quiz providing a quick glimpse into a manufacturer’s vitality. The new tool asks questions of the manufacturer relating to strategy, alignment, collaboration, and ultimately optimization within the company’s supply chain. 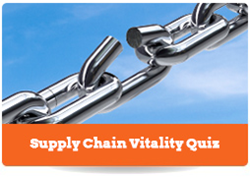 The Supply Chain Vitality Quiz is a 10-question quiz that provides a general baseline for understanding the strengths and weaknesses of a manufacturer’s supply chain effectiveness. Quiz takers are asked to provide honest feedback regarding their company’s use of specific tools and strategies, including how sourcing decisions are made and what kind of formulas are used to account for supply chain costs. At the end, a summary of the answers are provided, and can be downloaded and printed for further review or action. The MEP Supply Chain Optimization (SCO) program is a strategic approach to solving the challenges of U.S. manufacturers by promoting a better flow of product from suppliers to customers resulting in reduced costs, improved quality and shortened lead times. Currently being deployed through Centers across the country, MEP SCO aims to make the scalable, customizable program available to manufacturers of any size, and at any maturity level. The MEP Supply Chain Optimization program was developed as a direct result of a Voice of the Customer Study conducted by Accenture, McKinsey, Boston Consulting Group and MEP, respectively. In the study, manufacturers identified critical and highly important gaps when considering their supply chains. MEP developed a program to address those challenges with a comprehensive program that is helping U.S. manufacturers increase visibility, reduce risk and increase their competitive edge. As part of the National Institute of Standards and Technology, MEP, is a nationwide network consisting of 60 Centers, with 1,400 technical experts focused on solving manufacturers’ challenges. NIST-MEP offers its clients a wealth of unique and effective resources centered on five critical areas: technology acceleration, supply chain optimization, sustainability, workforce and continuous improvement.